"After having purchased our first Shiloh in 2003, our goal at Brick Chapel Shilohs has been to continue to educate and be Shiloh Ambassadors while we contribute, on a small scale, to the growth and development of the Shiloh Shepherd Breed. We currently have 4 Shilohs in our family. Our dogs and future litters will always be home raised in a loving, family environment. 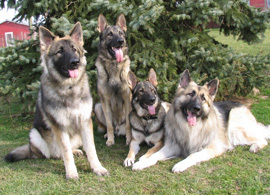 As ambassadors of the breed, we are happy to talk with and meet anyone interested in Shiloh Shepherds. It is hard to understand what a unique breed they are until you meet them in person. Thank you, and come back often see updates on our Shiloh family. Brick Chapel Shilohs...Standing the Test of Time "